Northampton Honey: A long tough winter. The blossoms are out on our pear tree and on trees all over the neighborhood. It's a hopeful time, and now we need hope. The winter was amazingly hard on our bees, and we lost lots of them. We entered winter with 22 hives and now we have around a dozen, I can't recall exactly. The combination of a dry hot end to summer and fall wasn't kind to our bees. Without nectar colonies didn't produce so many young bees and most of our hives entered the winter with small colonies of older bees. On some years this could have been OK, but last winter got cold and stayed cold and we had a long cold spring. Without a January thaw or even some warm days in April our bees stayed hive bound. Even now, cool day temperatures keep too many bees from flying even though there's nectar and pollen in dandelions and in the blossoms of pear and apple trees around neighborhood. Much of this was my reaction to last years wintering strategy. I in the fall of 2009 managed the hives to be large and powerful going into winter. I wrapped all the hives and filled extra supers (boxes) with maple leaves for a kind of attic insulation. This allowed the bees to use less honey over the winter staying warm. I fed the bees in early spring and whoa! did we ever have bees. We had so many bees that it seemed like we had a swarm every couple of minutes. Resolving not to repeat that I cut way back on feeding and wrapping hives. The long winter and slow spring took a lot of colonies. I am learning that a good maple syrup season can mean a tough spring for bees. Well, that's behind us now. 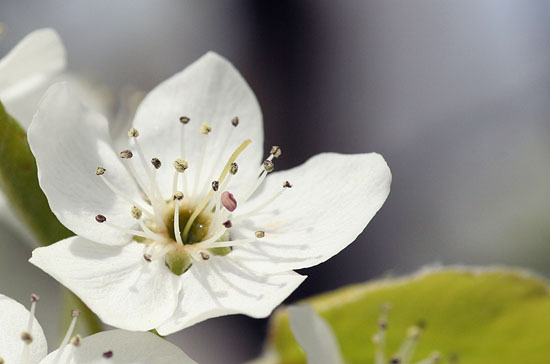 With pear blossoms abundant we hope for warm days and lots of flying weather. Agriculture teaches things in a way that's especially hard. In school when we missed the deadline for a paper we could make an excuse but agriculture doesn't listen. Many years ago I worked for a farmer named Tom Baggot. I had a great deal of responsibility for a very young man. Occasionally I would make mistakes and sometimes costly and complex mistakes. Inevitably I would come to Tom and say, "I'm sorry" and try and explain how the mistake had come to be made. Tom would always say. "Adam, I am not interested in that. Explain to me how things are now so that we can make a plan to move forward." He could be mad or moody or exasperated when I told him how things were wrong, but he always brushed it off an looked forward. Agriculture doesn't care why you made the mistake, it's simply asks if you're moving forward. We are. Hope springs eternal. And spring brings eternal hope!